Provide comfort for the family of Robin Tatton with a meaningful gesture of sympathy. 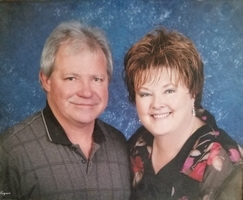 Elmo, Ut - Robin Christine Hall Tatton, age 66 was called home to her loving Husband and Heavenly family on April 8, 2019 in Elmo, Utah. Robin was born on January 17, 1953 to Richard Joe and Georgia Evelyn Heintz Hall where she was the oldest of 6 children. She married Brent Tatton in Helper, Utah in 2002. He preceded her in death in 2007. She is survived by 1 son and 1 daughter; Andy Joseph Shuss, of Walden, Co., Misty Menard, of Fort Collins, Co., also survived by 5 grandchildren 3 brothers and 1 sister; Rick, Scott, Kevin, Kristin. Preceded in death by a sister; Cindy. A Celebration of Robins life will be held at a later date. To send flowers in memory of Robin Christine Tatton (Hall), please visit our Heartfelt Sympathies Store. Provide comfort for the family of Robin Christine Tatton (Hall) by sending flowers. We are happy we were able to get to know Robin and that she joined our Tatton family as Brent's wife. Their life together was cut short, the time they had together was always full of good times. Our condolences go out to Robin's family and may she RIP now without pain and suffering. Cory, Joan, Amber, Cambri, Cam and Sam.